Mullins Tyres was established in 1999 and is still recognised as a hassle free informative tyre shop to the locals n the New Lynn, Avondale, Te Atatu and Rosebank Road areas. Our move to the same site as the Rosebank VTNZ outlet recently (on the Rosebank Road Roundabout) has given our customers “instant service” for the Tyre WOF and COF failed inspections. Mullins Car Tyres Avondale sell and recommend all popular brands of tyres with normally three options in each tyre site on offer to cover variations in price and loading index. Help yourself to a free coffee while we deal with your tyre issues. Let us check your tyre pressures, even if you didn’t buy your tyres off us. We want you to be safe and achieve the best possible mileage from fuel and tyre wear. 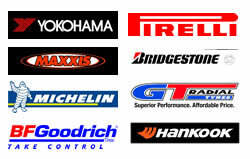 Contact Mullins Car Tyres in Avondale for your next car tyre replacement or repair.